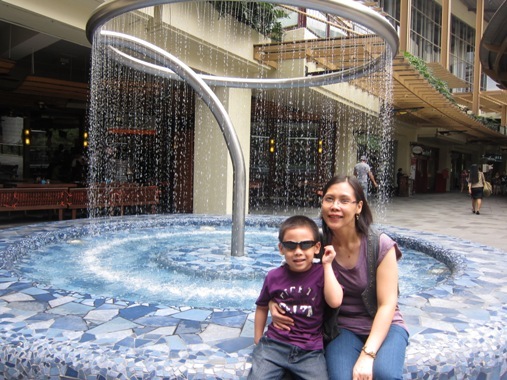 This picture was taken sometime in March when we went to Greenbelt Mall in Makati City. These days, our son is giving us a hard time when we’re taking his picture because he always gives us wacky poses when all we want is a really nice smile showing his dimpled cheeks. Good thing he cooperated here to have his picture taken with Mommy beside this lovely fountain. That’s my little boy wearing his favorite sunglasses, and that’s Mommy smiling for the camera, too. Didn’t you notice I have smooth skin here? That’s because I have finally discovered the best way to get rid of pimples, which is getting enough sleep. Care to share your secrets to great looking skin? This entry was posted in Greenbelt, Musings, Personal. Bookmark the permalink.